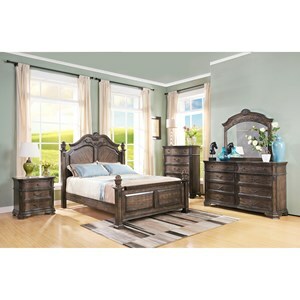 The Claire King Bedroom Group by New Classic at Beck's Furniture in the Sacramento, Rancho Cordova, Roseville, California area. Product availability may vary. Contact us for the most current availability on this product. 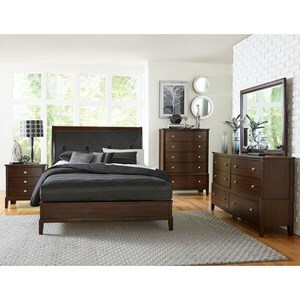 Add some contemporary style to your master suite with the Claire bedroom collection. Each piece features a two-tone wood finish that is also trimmed with mirrors. The bed has an upholstered headboard that showcases button tufting and built-in lighting, providing both style and function. Storage pieces include a nightstand, dresser, and chest of drawers, and will provide your bedroom with plenty of space to keep your clothes organized. Bring Claire into your bedroom today for a stylish update to your space. The Claire collection is a great option if you are looking for Contemporary furniture in the Sacramento, Rancho Cordova, Roseville, California area. Browse other items in the Claire collection from Beck's Furniture in the Sacramento, Rancho Cordova, Roseville, California area.